Suitable from Birth. Compact Umbrella-fold large capacity shopping basket. Accomodates most brands of infant car seats. (Car seat not included). Will accept the following car seats: Graco Snug Ride-Safe Seat, Peg Perego Primo Viaggio & SIP, Evenflow Discovery, Costco Designer 22, Costco Eddie Bauer, Britax Companion, Combi Tyro, Combi Center, Combi Connection, Century. This store is drastically overcharging for the Easy Traveller. This stroller is exactly what I was looking for. It is lightweight and easy to use. I don't kick the wheels when I walk (I almost always do with any other stroller), it works great with Britax (it locks in over the bar in the back). It is so easy to use and so manuverable that I couldn't be happier. I am dreading when my infant outgrows his car seat and I have to move on to a different stroller. Excellent product. A definitely 5 star for those who are just looking at basic functionality. I would definitely recommend it to others. Really does what it's suppose to do very well. I'm a bit harsh on rating. I just think that if it looked better and offered a more usable cup holder, I would have given it a 5. This one is by far one of our best baby purchases. I looked at the snap-n-go and universal carseat carrier before deciding on this one. Let me tell you, there is no comparison. The Mac is a bit more expensive, but it is super light weight, easy to fold and unfold and takes up such little space in the trunk of the car; not to mention the good looks. Highly recommended! This is the best baby purchase out there! I know "love" is a strong word, but I really love our Maclaren Easy Traveller. We purchased the Graco travel system for our baby, and it really is awesome with the full size stroller and the great car seat. However, we travel quite a bit (once a month through the airport) and the Graco stroller is not travel-friendly. The Maclaren Easy Traveller is a breeze to take through security checks. 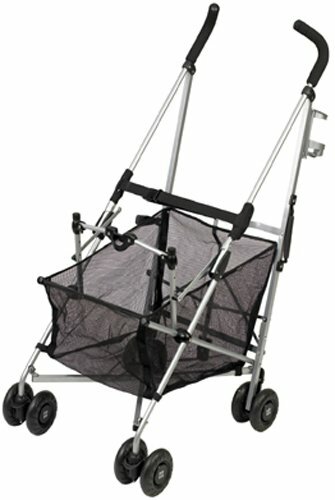 It wraps up like an umbrella stroller, and opens up easily. The car seat locks in without problems. If your baby is not at the point of sitting up on his/her own, and you know you'll be using the carseat for quite some time, it just makes sense to have an Easy Traveller. Several other notes: We didn't connect the cup holder, so it's easier for us to use, plus I like the benefit of not having anything in between me and the baby. He feels "closer". Also, the basket was able to hold quite a bit of stuff on a recent shopping trip. It has easy access from the front, but a little tougher to get big things in from the back. I was concerned that the wheels didn't look sturdy enough, but Maclaren knows what they're doing. This thing has held up through gravel. One of the baby items I use almost everyday. I tried other brands but this was the lightest & compact since it folds twice.